American policy after the Anschluss was founded on two main assumptions. The first was that the ‘extremists’ were in complete control of Germany and that Czechoslovakia was the next target of Nazi expansion. 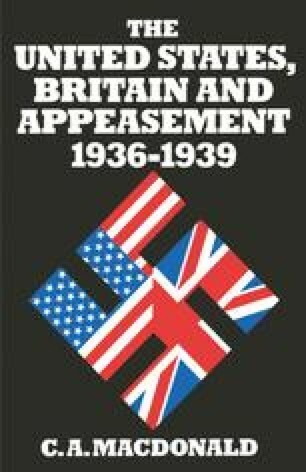 The second was that Chamberlain would be prepared to bargain with Hitler at the expense of the Czechs. British policy was interpreted in the light of conclusions reached during the Eden-Chamberlain quarrel. It was assumed that Chamberlain’s victory meant the triumph of selfish City interests which stood for a policy of ‘peace at any price’. As Roosevelt informed the French ambassador, the Prime Minister was a ‘City man’ who had abandoned France in the hope of making a ‘business deal’ with the dictators.1 The United States, therefore, maintained its distance from Anglo-German negotiations after the Anschluss. Roosevelt would not endorse an immoral bargain reached at the expense of Prague and hoped to restrain Hitler by leaving the American position undefined. There remained some ambiguity about his position at this point however. While disapproving of Chamberlain’s actions and claiming that they would merely stimulate German greed, the President put forward no alternative and seemed content to couple public coolness with private condemnation of British policy. The domestic political situation was undoubtedly an inhibiting factor.